A member of Spain’s best-known wine family, Marimar Torres moved to San Francisco in 1975 to promote Torres wines in the United States. In 1986, backed by the family, she planted Pinot Noir and Chardonnay vines in the Sonoma Valley. Marimar Estate Vineyards and Winery released its first wines in 1991 and has gone on to become one of Sonoma’s leading boutique producers. Last week, she was in British Columbia to get more of her wines into this market. She already has a peripheral connection to British Columbia: her winemaker is Napa consultant Bill Dyer, who made the first seven vintages at Burrowing Owl Estate Winery and subsequently consulted on several vintages for Church & State Wines. The Torres family’s history in wine began in 1870 when Jaime Torres returned to Spain with a Cuban fortune and teamed up with a brother to launch the business. Jaime is remembered today for building the world’s largest wine vat (600,000 litres). It was destroyed when the winery was bombed during the Spanish Civil War. The winery was rebuilt in 1940 by the leader of the family’s next generation, Miguel Torres, to whom the honorific “Don” was applied through much of his life, perhaps because he was hard-driving and somewhat imperious. He was still influencing the business when he died in 1991 at age 81, having been succeeded by his son, Miguel A. Torres, Marimar’s brother. Miguel A., who was born in 1941, studied enology in France. When he joined the family business in 1962, he persuaded his father to plant Cabernet Sauvignon, along with other French vinifera. The winery’s reputation moved to a higher level in 1979 when a Cabernet Sauvignon from Torres won top honours in the so-called wine Olympics in Paris. According to a recent article in the Irish Times, Miguel A. was “frustrated by the length of time it took his own father … to hand over the reins.” So he laid down a policy that managing directors should retire at 70. He has not retired yet himself. But when he does, there are two family members being groomed. His daughter, Meriea, is the winery’s technical director, and his son, Miguel Torres Jr., is running the major winery that the family established in Chile in 1979. By basing herself in California, Marimar (who was once married to wine critic Robert Finnegan) has carved out a respected and independent place in wine while acknowledging the family heritage and its Catalan roots. The first vineyard planted in Sonoma, 60 acres in size, is called the Don Miguel Vineyard. A more recently planted 12-acre vineyard is called Doña Margarita, for her late mother. Both have adopted organic viticulture in 2003 and are moving toward biodynamic methods. The winery, which opened to the public in 1993 and has a capacity of 15,000 cases, is designed like a Catalan farm house. And in the family tradition, Marimar, who was born in 1945, is being joined in the California winery by daughter Cristina, an economics major at Princeton University. This is also a literate family. Marimar has written two cookbooks: The Catalan Country Kitchen and The Spanish Table: The Cuisines and Wines of Spain. Her brother, Miguel A., has written a number of highly-regarded books on Spanish wine. While the Torres wineries in Spain and in Chile have developed large portfolios of varietals and blends, Marimar Estate is tightly focussed just on Chardonnay and Pinot Noir. That reflects the varieties best suited to the two cool vineyards, which are six and 10 miles from the Pacific Ocean. The cool growing conditions show through in the vivid and fresh fruit flavours of the wines. Here are notes on the wines that can be found in various private wine stores in Vancouver (such as Legacy, Kitsilano Wine Cellars and Dundarave Wine Cellars). The prices shown here are suggested retail prices in California. Expect the Canadian prices to be somewhat higher. Marimar Estate “Acero” 2009 Chardonnay (US$29). This is an exceptional unoaked Chardonnay, vibrant with aromas of lime and tangerine and with flavours of tropical fruits, including tangerines. Acero is Spanish for steel, the wine having been fermented and aged in stainless steel. 90. Marimar Estate “La Masía” 2009 Chardonnay (US$35). La Masía is Catalan for farm house. This is a barrel-fermented Chardonnay, with notes of honey and tropical fruit on the nose and with flavours grapefruit, stone fruit, apples, hazelnut and spice – a very complex and satisfying wine. 92. Marimar Estate “Dobles Lías” 2008 Chardonnay (US$45). The name means double lees – the wine had extended lees contact in the barrel, resulting in a toasty and rich texture. The flavours recall honey and marmalade with subtle oak notes. 90. Marimar Estate “La Masia” 2007 Pinot Noir (US$39). This is a bright, charming Pinot Noir, loaded, as the winery’s own notes say, “with black cherry flavours.” I also found raspberry and mocha. 90. Marimar Estate “Mas Cavalls” 2007 Pinot Noir (US$44). Mas Cavalls is Catalan for horse farm because the winery also has an equestrian centre near the vineyard. This is a stunning Pinot Noir, with rich layers of flavour – black cherry, wild strawberry, spice, even earth notes. It is what the critics would call “barnyard” and that is positive. 92. Marimar Estate “Cristina” 2007 Pinot Noir (US$49). This wine is a special selection of 20 barrels that the winery believes shows the best of the terroir of the Don Miguel Vineyard. It is rich on the palate, with black cherry, plums and blackberry flavours. The texture is classically seductive. 93. On your next visit to Tinhorn Creek Estate Winery, walk to the northern border of its Golden Mile vineyard and look over the edge. You will see the winery’s compost field. While this is not the most photogenic feature at the winery, it is a key part to Tinhorn Creek’s focus on sustainable winegrowing. * In 2004 the winery began releasing beetles to control a particular weed (the beetles eat the stems), replacing herbicides. Also in 2004, the winery became involved in a major project to restore the antelope brush habitat in the south Okanagan. * A trial program with snake fences, begun at Tinhorn Creek, is now widely used in the south Okanagan to safeguard people from snakes – and to protect the endangered snakes from people. These are low fences, low enough to step over, that prevent snakes from slithering into the vineyards. There is one, for example, at the top end of the winery vineyard, ensuring that snakes stay in the grassland on the hillside. * The winery is believed to be the first in the Okanagan to convert to biodiesel for its farm machinery. * The winery – like a growing number of its peers -- has been ramping up a program to compost every residual, from spent grape skins and seeds to food wastes from its restaurant. The compost then is put back onto its 130 acres of vineyard, much of it on sandy soil on Black Sage Road that benefits from the addition of the compost. It is not always the easiest way to deal with waste. For example, it would be cheaper to take restaurant waste to the local landfill. Tinhorn Creek has developed a method of fermenting these wastes before mixing them into the compost. That eliminates the odours that could attract bears and also annoy winery visitors. * The winery has numerous programs to conserve water in its processing and in its vineyards, water being a precious commodity in the dry Okanagan. Currently, the winery is well into a four-year $1 million conversion of its overhead irrigation system to drip irrigation. Drip is so much more efficient that it can reduce the amount of water put onto the vineyard by as much as 75%. * The winery has an extensive health and safety program developed over the last two years by a committee of the employees. The employees actually identified 900 workplace hazards – everything from dealing with confined spaces to avoiding repetitive strains. This initiative has changed the entire culture at the winery, and for the better. That is just for starters. The winery uses energy efficient light bulbs, paperless faxes, and recycled packaging products whenever possible. This is a winery that is truly serious about have a light footprint on the environment. Tinhorn Creek is certainly not alone among Okanagan wineries in working to be green, but it seems to be in a leading position. A bean counter might ask whether wine consumers will reward Tinhorn Creek’s laudable efforts by buying its wines. I don’t think Tinhorn Creek is engaged in good works in the expectation of gaining more sales; the management here is not cynical. However, the rising green sensibility in society in general is certain to translate into better sales for those wineries making an effort at being good citizens. Here are notes on current Tinhorn Creek releases. With the exception of the rosé and the new white blend, most of the Oldfield Series wines were released last fall and may have been reviewed here. I have another opportunity to taste them this spring, however. Oldfield Series is the winery’s designation for its reserve tier. Tinhorn Creek Pinot Gris 2011 ($17.99). In this vintage, the winemaker tweaked its most popular white by letting 30% ferment in small stainless steel barrels and putting it through malolactic fermentation. When assembled with the other 70%, this portion softened the acidity and broadened the palate. The wine is still a bowl full of fruit brimming with pears and apples. 90. Tinhorn Creek Gewürztraminer 2011 ($17.99 for a production of 3,640 cases). This is one of the winery’s drier Gewürztraminers, showing classic spicy aromas and flavours of grapefruit. This is a very good wine with seafood. 88. Oldfield Series 2Bench Rosé 2011 ($22.99). The third vintage of Tinhorn Creek’s rosé, it is made in greater volume that in previous years because the vintage gave the winery more Cabernet Franc best suited for rosé. This wine is crisp and dry, with aromas and flavours of raspberry. It is a light, refreshing wine looking for a picnic. 88. Oldfield Series 2Bench White 2011 ($22.99 for a production of 1,091 cases). This wine, which will be released June 1, is complex blend of 52% Chardonnay, 31% Sauvignon Blanc, 11% Viognier and 3% each of Sémillon and Muscat. It begins with attractive citrus, herbal, grassy and tropical fruit aromas; it delivers lovely fruit flavours and has a refreshing, zesty finish. 90-92. Oldfield Series Merlot 2008 ($27.99 for a production of 1,200 cases). This elegant Merlot begins with aromas of red berries and vanilla. It delivers flavours of blackberry, plum, chocolate and vanilla. 90. Oldfield Series Syrah 2008 ($34.99 for a production of 528 cases). This wine begins with aromas of pepper, meat and plum and delivers flavours of plum, fig, game meats and pepper, all with a polished texture. 90. Oldfield Series 2Bench Red 2008 ($34.99 for a production of 731 cases). This is 40% each of Cabernet Sauvignon and Merlot and 20%, Cabernet Franc, aged almost 20 months in French oak barrels (a mix of new and used). This is still a wine for cellaring, with its backbone of grippy, earthy tannins supporting flavours of black currant and chocolate. 90. On June 8, Black Hills Estate Winery is opening a $1 million wine shop right on Black Sage Road. It will be a welcome improvement in the wine touring experience. Initially, Black Hills opened in 2001 in a large Quonset hut. The tasting room, when it was open, was a couple of planks over several barrels. When a modern winery was built several years ago, it was sited well downhill from Black Sage Road. It was a bit of a hike down to the winery; and the climb back up to the road took away one’s breath, especially if you were carrying your wine purchases. The new wineshop is “on the level”. It is a few hundred yards south of the winery on a 14-acre vineyard that Black Hills purchased last year. The wine shop, which is just at the edge of the road, sits on a knoll with a grand view of the valley. Black Hills has had a tasting room open at the current winery location. But improved access of the new wine shop will enable the winery to ramp up what it will be offering visitors. Tutored tastings of five wines conducted by a so-called wine evangelist will be available at $20 a person. Plans are being made as well to offer occasional vertical tastings of Nota Bene and other Black Hills wines. The proposed wine shop hours are 10 am to 6 pm from spring to fall. Appointments will not be necessary but are advisable when the wine touring season gets busy. Black Hills has just released its new wines for this season. The initial offering of Nota Bene 2010, the flagship red blend, is technically sold out at the winery. However, Black Hills always holds some back for special releases later in the year. As well, you can usually find some in private wine stores. Just this week, I spotted Nota Bene 2008 in a wine store in the airport at Calgary. Here are my notes on the releases. Black Hills Nota Bene 2010 ($53 for a production of 3,300 cases). As usual, this blend is anchored with Cabernet Sauvignon, at 57%, with Merlot at 32% and Cabernet Franc at 11%. The Cabernet Sauvignon contributes a touch of mint to the aroma and flavour, complementing the cassis aroma. The wine has luscious flavours of black currant and plum, with long, ripe tannins. The wine finishes with a polished elegance. 92. Black Hills Carmenère 2010 ($50 for a production of 300 cases). This wine has become the other cult red wine at Black Hills. Made from vines planted in 1999, it was the first Okanagan Carmenère and remains one of a very few examples of this late-ripening variety. The wine is so eagerly sought that Black Hills converted its entire (small) Chardonnay planting to Carmenère. More Carmenère will be planted in the recently acquired vineyard, to increase total production to about 1,000 cases a year. This is an interesting and complex red with aromas of pepper and red berries. The pepper carries through to the palate, along with flavours of plum, black cherry and chocolate. The alcohol is a moderate 12.2%, as it was in 2009, a much warmer vintage. This seems to be a variety that develops flavour before packing on the sugar. 90. Black Hills Syrah 2009 ($35). 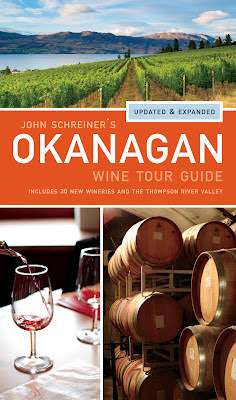 In his notes on the wine, Graham Pierce, the winemaker, accurately describes this as an “exuberant wine with aromas of raspberry, cherry cola, blackberry and chocolate.” On the palate, it has the classic flavours of a South Okanagan Syrah – deli and game meats, plum, fig, mocha and vanilla. It is a big, satisfying red. 91. Black Hills Alibi 2010 ($25). This is 75% Sauvignon Blanc and 25% Sémillon. “I don’t want to make a one-dimensional New Zealand style of Sauvignon Blanc,” the winemaker says. The Sémillon was fermented in oak puncheons before being added to the blend. The wine begins with herbal and citrus aromas. On the generous palate, there are flavours of apricot, pineapple and grapefruit. The tangy finish is clean and refreshing. 90. Black Hills Viognier 2010 ($25 for 700 cases). The wine begins with a dramatic and fruity aroma – pineapple, grapefruit, peach – and delivers that bowl of fruit on the palate. The wine also has a crisp spine of minerals, and perhaps a touch of the tannin that resides in the skin of this white. The finish goes on and on. 91. For wine lovers, one the most anticipated signs of spring is the release of the new wines. In recent weeks, I have been at several release events. Because the notes are beginning to pile up, I have grouped three boutique winery tastings into this posting. Many are wines from 2011, a vintage with surprisingly good whites and rosés. The first was a tasting of 2011 wines from sister wineries Le Vieux Pin and LaStella, both owned by Enotecca Winery & Resorts. These are two boutique wineries in the south Okanagan, both with premium wine portfolios and, occasionally, bold pricing because it is expensive to make premium wines. The whites and the rosé are more moderately priced. Le Vieux Pin Vaïla 2011 ($25 for 989 cases). This dry Pinot Noir rosé has developed such a cult following that one fan has already ordered nine cases for hopefully a great summer. It begins with a lovely rose petal and salmon hue; it has aromas of rhubarb, grapefruit and strawberry and flavours of strawberry. 90. Le Vieux Pin Sauvignon Blanc 2011 ($35 for 535 cases). Think of a subdued Loire style Sauvignon Blanc, with herbal aromas and flavours along with the varietal’s characteristic gooseberry and grassy notes. The finish is dry. About 24% of this was fermented in French oak with weekly lees stirring to add to the rich texture. 89. LaStella Leggiero Un-Oaked Chardonnay 2011 ($25 for 340 cases). The grapes for this wine are from 20-year-old vines at the Inkameep Vineyard. Fermenting and aging this wine in stainless steel preserved the pure and focussed fruit flavours. The wine is crisp like Chablis, with apple and citrus flavours. LaStella Vivace Pinot Grigio 2011 ($25 for 960 cases). This wine begins with alluring aromas of pear and guava. On the palate, it has juicy flavours of pear and kiwi, with a finish that goes on and on. 92. LaStella La Stellina Rosato 2011 ($25 for 560 cases). This is an off-dry rosé made with Merlot that was picked with rosé in mind. The hue is dark; the aromas show notes of plum and earth; it tastes of plums and black currants. The touch of residual sweetness gives the wine a fleshy texture. 90. Clos du Soleil Winery is a boutique winery in the Similkameen Valley with a Bordeaux focus on the wines it makes. The winery is owned by four couples but the public face is Spencer Massie, a retired – but still youthful – naval officer who has graduated from passing the port to a serious winery. If the winery still flies below the radar screen, that is because it has not had a tasting room until this year. Even then, an appointment is a good idea because the individuals who look after the wineshop also have vineyard and winery duties. Clos du Soleil Rosé 2011 ($17.90 for 390 cases). The varietal in this dry rosé wine is Cabernet Sauvignon. The raspberry and cranberry notes on the nose transform to strawberry and cherry flavours on the palate. The finish is crisp and refreshing. 90. Clos du Soleil Capella 2010 ($24.90 for 535 cases). This is a crisp, disciplined Sauvignon Blanc, with herbal and grassy aromas and flavours and with a dry finish. 90. Clos du Soleil Pinot Blanc 2011 ($18.90 for 180 cases). This is a departure from the Bordeaux theme here, because, for the second year in a row, the winery has been able to purchase excellent fruit from one of its Similkameen growers. The wine is varietally classic – apple aromas and flavours, full on the palate, with minerals on the backbone. 88. Clos du Soleil Signature 2009 ($39.90 for 275 cases). This red blend incorporates all five Bordeaux red varieties in a full-bodied wine with aromas of black currants and vanilla and with flavours of fig, black cherry, vanilla and chocolate. This is a wine for cellaring. 91. Clos du Soleil Winemaker’s Reserve 2009 ($58.85 for four barrels). This is a blend of 50% Merlot and 25% each of Cabernet Sauvignon and Cabernet Franc. The wine is big and concentrated. It presents a core of sweet fruit flavours – plum, fig, mocha, vanilla – supported elegantly with long, ripe tannins. The wine is definitely built for the long haul; the winery estimates 10 to 15 years of development. 92. Alto Wine Group of Okanagan Falls is a custom crush winery that serves several labels. Alan Dickinson, the lead partner at Alto, has a label called Synchromesh which emerges from his family’s long interest in motor cars. His father, John, used to race in Britain; and the Dickinsons remain active in British car circles in Vancouver, as well as in wine. Alan and John recently hosted a tasting of new releases for the friends of the family who have discovered the wines. Synchromesh Amelia Block Gewürztraminer 2011 ($30 for 23 cases). This wine got its name when Alan’s partner, Amelia, asked that he spare the remaining block of Gewürztraminer after frost had wiped out many of the vines. Good call. The wine is delicate and fresh, with notes of grapefruit on the palate and with minerals and white pepper on the finish. 88. Synchromesh Riesling 2011 ($30 for 41 cases). At this stage in its development, this is a tangy, well-balanced white with citrus notes and aromas. But to understand where this wine is going, you need to taste the spectacular 2010 Riesling to see how much richness and depth and kerosene characters develop when this German-style Riesling gets to age. 88-90. Synchromesh Pinot Noir Rosé 2011 ($20 for 125 cases). This begins with a vibrant strawberry hue and aroma. On the palate, there are flavours of cherry and strawberry. The wine shows the silken texture of Pinot Noir. 88. Synchromesh Tertre Rouge 2010 ($35 for 70 cases). If you are a motorsport fan, you will know that this wine is named for a corner at the Le Mans racing circuit in France. The wine is 66% Merlot, 18% Cabernet Franc and 13% Cabernet Sauvignon. I know the math does not add up but it is on the website. “New” math certainly does not interfere with the taste of the wine, a delicious drop with sweet fruit on the mid-palate – flavours of black currant, blueberry and chocolate. 89-90. Darryl Brooker, the Australian born winemaker who joined CedarCreek Estate Winery in the spring of 2010, has now begun to release the wines from his second Okanagan vintage. Both were challenging vintages but the evidence is in the glass that Darryl, who was new to the Okanagan, was on top of both – especially 2011. Even though that spring was late and cool, the rest of the year had conditions that produced superb aromatic whites and Pinot Noir, the flagship wines at CedarCreek. CedarCreek president Gordon Fitzpatrick quietly beams with pride releasing wines like that in 2012. The winery is celebrating its 25th anniversary this year and wouldn’t mind making a splash. You could argue that the winery is even older. Under its founding owners, it opened in 1980 at Uniacke Wines. The winery struggled – they all did in the early years – until Ross Fitzpatrick bought it late in 1986, relaunching it the following year as CedarCreek. Ross, a successful mining executive and later a senator, had grown up in the Okanagan and was returning to his roots. His son, Gordon, joined the winery in 1996. That was a baptism of fire: 1996 was such a cold and late vintage that Gordon recalls picking Riesling grapes during a November snow storm. In 1998 the winery recruited Kevin Willenborg from the Louis M. Martini Winery. He is believed to have been the first graduate of the University of California’s renowned winemaking school at Davis to work in the Okanagan. When he went back to California in 2000, he was succeeded by Tom DiBello, another UC Davis graduate. Tom stamped a style on CedarCreek in the 10 vintages he spent there. The winery was Canada’s winery of the year twice during that decade. No wine had more of Tom’s fingerprints than its Ehrenfelser. An aromatic fruit bowl of a wine, it has a cult following. Darryl, of course, had never made Ehrenfelser before coming to CedarCreek. Born in Canberra in 1973, he made wine in Australia, New Zealand and Ontario before coming to the Okanagan. Around the world, there is only a modest acreage of Ehrenfelser, a vinifera cross developed in Germany and named for castle ruin near Rüdesheim. He is joking but he also listened to the consumers. The 2011 version has a little more residual sugar and less acid than 2010, resulting in more punch to the fruity aromas and flavours. It is still versatile with food while delivering the expected basket of fruit. CedarCreek’s followers are now awaiting the release of the winery’s 2010 Pinot Noir because Darryl made changes in the choice of barrels and in the general style. Those wines should be released by this autumn. And keep on eye on future Pinot Noir and Chardonnays. The winery will be building a new crush facility dedicated to these varietals. Meanwhile, here are notes on the 2o11 releases to date. CedarCreek 2011 Riesling ($17.90 for a production of 1,355 cases). Darryl had grapes available from two mature blocks: from vines planted in a Westbank vineyard in 1979 and from vines planted on CedarCreek’s vineyard near Kelowna in 1991. He decided to pick the grapes on flavour, not on the numbers. So this wine ended up with 10.8% alcohol, 12.2 grams of acid per litre and 18.45 grams of residual sugar. He also fermented the wine very slowly, at cool temperatures, for about 60 days. The result is a tour de force with tangy lime and grapefruit flavours, with weight on the palate and with superb balance. As good as it is now, it will age very nicely for another two or three years. 91. CedarCreek 2011 Ehrenfelser ($18.90 for 1,140 cases). There will certainly be no death threats for this juicy, tropical white with citrus aromas and flavours of pineapple, apricot and pink grapefruit. 89. CedarCreek 2011 Gewürztraminer ($17.90 for 2,053 cases). The surprise in the winery notes is that 10% of this wine was fermented in French oak (not new). It was a good trick, adding to the viscous texture. The wine begins with aromas of spice and rose petals, continuing to flavours of lychee and spicy grapefruit peel. 90. CedarCreek 2011 Pinot Gris ($17.90 for 6,100 cases). A quarter of this wine was fermented in French oak; 10% of the juice was left on the skins overnight. The result is a rich, complex Pinot Gris with flavours of pear and ripe apple. 90. CedarCreek 2011 Rosé ($17.90 for 630 cases). The wine was made by bleeding some juice from every lot of Pinot Noir that was crushed last fall and fermenting the juice like a white wine. The skin contact has given this wine a lovely dark hue. There are aromas and flavours of cherry, raspberry and strawberry, with a touch of residual sugar to plump up the fruity flavours. 90. Time for a little self-promotion. Some of my readers will have used earlier editions of John Schreiner’s Okanagan Wine Tour Guide, the handy pocket-sized volume that came out first in 2006 with 248 pages. The fourth edition, now 368 pages but still $20, has just been published. It profiles 34 wineries that were not in the third edition just two years ago. In total, there are 161 profiles in the latest book, up from 100 in the 2006 book. I have extended the coverage beyond the Okanagan and the Similkameen to include both the Kootenays and Kamloops. Even frequent wine tourists will find many wineries that they have never heard about until now. Here is a quick peak to whet your curiosity either for the wineries or the book, or both. Most have websites where you can get more information than I have room to give here. Adega on 45th Estate Winery is a winery opening this spring in Osoyoos, not far from Nk’Mip Cellars. The owners are Portuguese; “adega” means wine cellar in Portuguese. Alto Wine Group is located in a rustic metal clad building just east of Okanagan Falls. It is a bit of a winemaker collective that produces a host of very good small labels including Synchromesh and DiBello. Artisan Food & Beverage Group is one of the members of the Alto co-operative, run by a consultant who lives in Vancouver and makes wines under the Siren’s Call label. Liquidity Wines is opening this year near Okanagan Falls and Blue Mountain Cellars, on a vineyard once farmed by Blue Mountain’s founder. The winemaker here is a young Australian who once worked for Tantalus. Baccata Ridge Winery is a new organic winery opening this summer in Grindrod, a small community near Enderby. It is just off Highway 97A. Celista Estate Winery opened last year at Celista, a community beside Shuswap Lake. This is B.C.’s most northern winery, owned by a couple who used to live in Yellowknife. Sunnybrae Vineyards & Winery is a charming Shuswap winery that also opened last summer. Double Cross Cidery at Function Junction is a new cidery and part of a popular fruit stand on Highway 33 at the north end of Kelowna. 50th Parallel Estate is an ambitious new winery not far north of Gray Monk and on the same side of Okanagan Lake. The winemaker is a Pinot Noir expert from a top New Zealand winery. Harper’s Trail Estate Winery is a new winery just east of Kamloops near the Lafarge cement plant. There will not be a tasting room for a year or so. Monte Creek Ranch Estate Winery will open nearby in several years. Privato Vineyard & Winery is north of Kamloops and will not have a tasting room. Heaven’s Gate Estate Winery opened a lovely tasting room last summer just outside Summerland on what used to be a peach orchard. SummerGate Winery and Tyler Harlton Wines are new wineries nearby and Saxon Winery is the former Hollywood & Wine Winery. Heron Ridge Estates Winery is a new fruit winery (blueberry wines) just outside Castlegar – this city’s first winery. Wynnwood Cellars, which makes grape wines, is the third winery in Creston. Three new wineries have opened beside Highway 97 south of Oliver. Intersection Winery at Road 9 (no wineshop yet) is owned by Bruce Schmidt, once national sales manager for Calona Wines. Maverick Estate Winery, a bit further south, is run by the winemaker at Burrowing Owl and his father-in-law, a South African doctor. Gold Hill Winery, which is just completing a grand tasting room, opened last summer beside Highway 97, midway between Oliver and Osoyoos. Niche Wine Company is a West Kelowna winery with no tasting room at this time. The young couple who own the winery are hand-selling the wines – Pinot Noir, Foch, Pinot Gris - in Vancouver. Okanagan Crush Pad Winery is a very modern winery in Summerland that does custom winemaking. This is where Haywire, Bartier Brothers, Bartier & Scholefield wines are made, among others. The wineshop only opens for wine festivals. Perseus Winery & Vineyards is almost in downtown Penticton. Nearby, Upper Bench Estate Winery is the former Stonehill winery under new management; and also selling cheese. Misconduct Winery, which was profiled in previous books, now has a tasting room, also on Upper Bench. Planet Bee Honey Farm & Meadery is a honey-lover’s paradise, near downtown Vernon. New to Black Sage Road is Platinum Bench Estate Winery, opening a wineshop this spring, and Time Estate Winery, Harry McWatter’s new venture, which has not yet begun building its winery. River Stone Estate Winery, near the Jackson-Triggs winery, opened last year with impressive wines. Two new wineries have opened on the Naramata Bench. Terravista Vineyards (no tasting room) is owned by former founders of Black Hills Winery. 3 Mile Estate Winery opened a wineshop last year on Naramata Road and 3 Mile Road. The Vibrant Vine/Okanagan Villa Estate Winery opened two years ago in Kelowna but the owners did not contact me in time for the previous tour guide. This is a must-visit winery where guests are given 3-D glasses to view the 3-D wine labels. While I don’t expect as many new wineries to open in the next two years, there still are others to come. Don Triggs, one of the founders of Jackson-Triggs, has just begun to build a new winery, called Culmina, on the Golden Mile and will be releasing wines in 2013.